What should you invest in first? My wife just got back (well, just before our Noosa trip) from a trip overseas to attend her nephew’s wedding; and, the young happily married couple decided to spend part of their honeymoon in Australia … so, they are staying with us right now! It’s also an opportunity for me to share my financial plan for our younger readers, whether single or married. Step 2: Use your pre-work spending and living standards as a guide to ensure that you save at least 10% of your gross salary; preferably more. Step 4: That includes any ‘found money’ such as: change found on the street; tax refund checks; small handouts/inheritences from friends/family (naturally, you will ‘up this’ to saving 95% of any LARGE handout/inheritence); etc. It won’t take too long to actually have some money (perhaps for the first time in your life) to think about actually INVESTING. So, what to invest in? Stocks; car parks; italian art; … ? It’s simple: your own home! But, what about the 20% Equity Rule and the 25% Income Rule, which will ensure that you can only afford to buy a shoe-box (literally) at this early stage of your financial life? – Borrow as much as the mortgage payment that you can afford, which will be the amount per month that you are currently saving (of course, you’ll want to keep a little buffer against extra expenses). When you (eventually) get tempted to ‘trade up’ to a bigger house, that’s when you apply the 20% Rule and the 25% Income Rule! But, shouldn’t you invest in something else first? Perhaps you’re not even married yet and can happily rent for a while? This is true: but, buy the condo anyway … then you can evaluate if your rent is so cheap that you should rent out the condo for a while before moving into it. Same applies if you move to another location: rent out the house/condo and rent for yourself elsewhere until you are ready to trade up (or across). Let’s decide whether, over the course of your life, real-estate will go up in price or down in price? The answer for all of history has been UP (over a sufficiently long period). 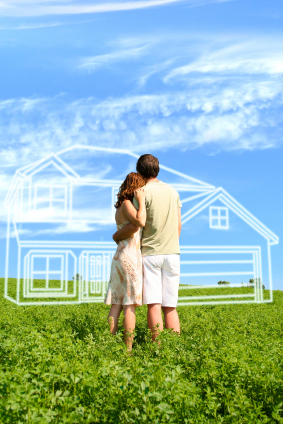 Decide whether you will ever want to own your own residence? Again, the answer is YES for the overwhelming portion of humanity (and, even if you think not, I guarantee that your eventual spouse will have a very hard go at convincing you otherwise). So, unless you have an overwhelming reason to believe that RE won’t go up in price for the next X month/years, then you are compounding your money at RE’s typical growth rate (6% … depending upon who you believe and where you live) TIMES the leverage that the bank is giving you LESS (your mortgage payment/costs – rent you would have otherwise paid). This entry was posted in Your House and tagged 7million, 7million7years, finance, house, Investing, Making Money 101, money, property, real estate, Rich, Starting Out, wealth by Adrian. Bookmark the permalink. While I am generally a fan of real estate and home ownership, there are plenty of examples where home prices have either failed to appreciate in real terms for very long periods (e.g. parts of Western Europe) or even declined (e.g. Japan over the last 20 years). IIRC, studies have shown that planning restrictions affecting the supply of land and demographic trends have been the biggest long term influences on house prices. In the shorter term, other factors such an employment and availability of credit are also relevant. One of the other issues for property at the moment is property taxes. Historically in many places they have risen faster than the general rate of inflation. With a lot of state/local governments desperate for cash to pay the civil servants’ etc it is a good bet that the trend will continue. This is not necessarily a deciding issue – just one more factor to take into account. Don’t forget transaction costs – if you know you will be moving in a couple of years you may want to hold off buying -otherwise any gains you may make will happily invested in some realtor’s new Lexus. This is what kept me from buying a place until I ended up way beyond the 20 /25% threshold. Wise decision – I ended up with a pile of cash instead of a ton of negative equity and got a killer deal when I did buy in the down market. If you are young and single, buying and then renting out extra space to room-mates seems smart. @ Jake – The whole point of this post is NOT to time the market … you got lucky at the expense of the market, that’s USUALLY not the case. @Adrian – what me? a market timer? never! it’s not like I moved all my investments to cash in spring 2008 because I felt nervous, only to buy back into the market in September 2008 – being proud of myself for having avoided a 5% in drop in the market – only then to see my portfolio get CRUSHED in the wake of Lehman? If I it goes in my favor, it clearly was a wise decision. If I it goes against my favor, it clearly was simple bad luck. I agree with you that in the long run investing in real estate generally will be pretty good… However investing everything in a single property is pretty risky. Traineeinvestor pointed out real estate isn’t a great investment every where… Is it a good investment where you happen to be living? Also, the high transaction costs force you to market time. That may be a good thing or very very bad thing. Since equities also have a good long term investment record, why not scale back on the primary residence somewhat and invest in both real estate and equities? Other investments also offer a safety net- as you could cash them out to avoid a foreclosure if you ever had a cash flow problem. @ Rick – Absolutely! The effect of the 20% Equity Rule and 25% Income Rule is to ensure that you are always investing AT LEAST 75% of your networth elsewhere (could be business, RE, equities, etc., etc. ).